A century ago or so, each college had its own admissions tests, but the inefficiencies of that became apparent. Eventually the country came up with two competing college admissions tests -- the SAT and the the ACT -- with colleges free to pile on eccentric essay questions or whatever they feel like. A few colleges may still have their own unique entrance exam (All Souls College * at Oxford has a famous one), but in the U.S. customized admissions tests are quite rare. Now you might think that if national tests are good enough for Yale, they ought to be good enough for, say, the New Haven Fire Department. And there are companies that publish tests for fire departments across the country to use. Yet, as we saw with the 2009 Ricci Supreme Court case, nobody thought it odd that New Haven had spent $100,000 on a consulting firm to dream up a customized test just for New Haven. That's pretty common in the fraught world of hiring firemen. How, exactly, is the New Haven FD so different from, say, the New Canaan FD that New Haven needs to spend one hundred grand on its own test? Caltech, Yeshiva, the Air Force Academy, and Smith are probably more different from each other than most municipal fire departments are different from each other, and yet they all find the SAT and ACT helpful. If you started your own college and then, as it got more successful, you announced that you were going to mandate the SAT and/or ACT as part of the admissions process, nobody would blink an eye. But if you start a business that grows big enough to get on the EEOC's radar, can you assume that you can just use some battle-tested national test? Or do you have to validate that the national test specifically works at your not-so-unique company? Over the last century, industrial/organizational psychologists have put a lot of effort into understanding the mysteries of testing. One of their major findings is that you don't need all that many different tests. The kind of things that can be measured well by testing aren't very unique to one college or one company or one job or whatever. Test optimization runs into pretty severe diminishing returns. And yet, almost nobody outside of the profession is aware of this major discovery of 20th Century social science. Why not? One reason is because a large number of the people who understand this -- professional I/O psychologists -- are employed to come up with new tests that will do what 100 years of I/O research says can't be done. 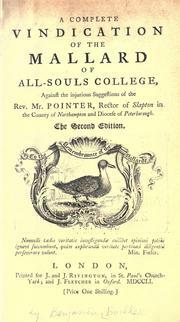 * By the way, once every century the learned dons of All Souls College stage a drunken torchlight parade while singing the "Mallard Song" about a giant duck devoured by their predecessors in the 15th Century. They are led by the specially chosen "Lord Mallard" (typically a distinguished classicist or a future Archbishop of Canterbury) who waves a duck on a pole. The last Hunting the Mallard was in 2001, while the next one will be in 2101. As I mentioned in the post below, the Atlantic has a long article about Silicon Valley start-ups attempting to use Big Data for job hiring testing. In the post-WWII era, the article says, American corporations did lots of testing of job applicants, but that fell out of fashion because science. Or something. So for the last generation, firms mostly rely upon resumes and interviews and try to avoid putting much in writing where it can get subpeonaed. But now in 2013, instead of giant corporations like P&G doing the testing themselves, it's going to be done for the giant corporations by cool little start-ups with cute names like Knack, Evolv, and Gild. So the New Testing won't be like the bad Old Testing of the 1950s when the racist, sexist white male power structure was building a giant middle class with secure jobs and pensions. Or something. Saw your post about pre-employment testing. It's been a while since I've had my head in the selection literature, but historically the general pattern of predictive validity for various selection methodologies has tended to follow a consistent pattern. The most predictive procedures tend to be those that emphasize biographical data, primarily work history and education, with coefficients in the .5 range or even better. This is followed by formal testing and is is where it gets a little tricky. Much of the early selection research was conducted or funded by the military, primarily the Navy through the NPRDC (now the NPRST). This is because the military can't spend a lot of time messing around trying to figure out what MOS people are suited for. Therefore, you have the two component tests you describe, an IQ-ish type of test and a group of aptitude-type tests. This kind of testing has relatively high predictive validities, almost as high as those for biographical data. The problem with both of these methodologies is disparate impact. Therefore, employers are going to great lengths to try to avoid correlations with prohibited dimensions. If you want to read something that strikes fear into the heart of HR managers, peruse section 5 of the Uniform Guidelines on Employee Selection Procedures. The whole federal guideline related to job testing is 16,942 words long. From skimming it, I'd say that, yeah, you could get away with testing. After all, P&G still gives a "Reasoning Test" that looks much like the GMAT that MBA applicants take. But this Guideline is intended to make you think long and hard before trying it. Sure, P&G got their test validated, but then P&G is largely staffed by competent people hired in part through testing. Can your staff successfully jump through every hoop in the 16,942 words? After all, your managers like interviewing. They each think that -- while everybody else is terrible at interviewing -- they are way above average at it. Interviewing lets them hire people they like. So why risk a federal lawsuit to make them hire people they feel less sympatico with just because they'd be better workers? What you really have above is one methodology that screens for conscientiousness (work history) and one that screens for intelligence (tests). Privately, Industrial/Organizational Psychology types will tell me that this is really the only thing that matters in selection. The rest is just BS. The real scandal in employee selection is the almost zero predictive validity of interviews. No matter how they are constructed they tend to contribute almost nothing to employee selection. Probably the best they do is identify obvious jerks, but even that is questionable. The reason we continue to do them is mostly cultural, I suppose. There is also a cult of "personality testing" inside of HR these days, the MBTI seems to be the favored tool, although there are others. This is obviously quite distinct from the AQFT-type testing referenced above. Understanding the HR field today one has to realize it embodies two very different and often contrary functions; selection and compliance. The first area is dominated by I/O psych types and the second by lawyers. The academic side of HR, in particular university based research into selection, is almost universally populated by the former. On the practitioner side, while most HR people are not lawyers, the legal issues tend to overwhelm everything. This has led to growth in formal structured procedures for all of these types of decisions and associated documentation requirements. Unfortunately, despite all of the attempts to create procedural fairness, the drift has been back into interview type "fit" exercises, and hence what HR people call the "like-me" problem. "They're Watching You at Work"
... By the end of World War II, however, American corporations were facing severe talent shortages. Their senior executives were growing old, and a dearth of hiring from the Depression through the war had resulted in a shortfall of able, well-trained managers. Finding people who had the potential to rise quickly through the ranks became an overriding preoccupation of American businesses. They began to devise a formal hiring-and-management system based in part on new studies of human behavior, and in part on military techniques developed during both world wars, when huge mobilization efforts and mass casualties created the need to get the right people into the right roles as efficiently as possible. By the 1950s, it was not unusual for companies to spend days with young applicants for professional jobs, conducting a battery of tests, all with an eye toward corner-office potential. “P&G picks its executive crop right out of college,” BusinessWeek noted in 1950, in the unmistakable patter of an age besotted with technocratic possibility. IQ tests, math tests, vocabulary tests, professional-aptitude tests, vocational-interest questionnaires, Rorschach tests, a host of other personality assessments, and even medical exams (who, after all, would want to hire a man who might die before the company’s investment in him was fully realized? )—all were used regularly by large companies in their quest to make the right hire. Hilariously elaborate testing suites were fashionable in the immediate postwar era. Robert Heinlein's 1948 sci-fi juvenile Space Cadet begins with the hero undergoing a couple of days of extremely expensive testing to try to get into the Space Academy (rooms turn upside down, ringers try to provoke test-takers into fistfights, etc.). The actual astronaut applicant testing a decade later was even more convoluted than Heinlein had imagined. But companies abandoned their hard-edged practices for another important reason: many of their methods of evaluation turned out not to be very scientific. Some were based on untested psychological theories. Others were originally designed to assess mental illness, and revealed nothing more than where subjects fell on a “normal” distribution of responses—which in some cases had been determined by testing a relatively small, unrepresentative group of people, such as college freshmen. When William Whyte administered a battery of tests to a group of corporate presidents, he found that not one of them scored in the “acceptable” range for hiring. Such assessments, he concluded, measured not potential but simply conformity. Some of them were highly intrusive, too, asking questions about personal habits, for instance, or parental affection. Unsurprisingly, subjects didn’t like being so impersonally poked and prodded (sometimes literally). Tom Wolfe's The Right Stuff has a very funny chapter about how around 1959 researchers went nuts with joy trying out any test they could think of on the initial astronaut applicants. The doctors were used to testing either sick people or average people, but here were hundreds of above-average test pilots and fighter aces willing to put up with anything to go into outer space. A radioactive enema test? Sure! The federal government's 1960 Project Talent exam, a post-Sputnik study of 440,000 high school students, contained two dozen subtests and took two days to administer. One discovery from all these massive exercises in social science was that you didn't actually need all these different kinds of tests. Some tests were just fashionable Freudian quackery. But lots of other tests all came up with reasonable but highly correlated results. Standard IQ-type tests would carry most of the load. For example, the military expanded its hiring test from the four-part IQ-like AFQT to the ten-part ASVAB, but it continues to use the AFQT subset to eliminate applicants. The other six parts of the ASVAB superset are then used for placement: e.g., if you score well on the vehicle repair knowledge subtest you might find yourself fixing trucks. But even if you ace the auto repair subtest, you have to make the grade on the IQ-like AFQT core to be allowed to enlist. I spent a couple of hours on the phone nine years ago with the retired head psychometrician of one of the major wings of the armed forces and he told me that the biggest discovery of his decades on the job was that g dominated practically anything else you could test for. This finding actually took a lot of the fun out of psychometrics. You'd dream up some seemingly brilliant test to find the perfect fighter jock or cook or file clerk, but when you'd get done extracting the general factor of intelligence from the results, you'd find that all the customization for the job you'd done hadn't added much predictive value over that of the heavily g-loaded AFQT scores. It makes sense to test for how much applicants already know about flying planes or fixing engines because the military can save time on training and how much they've already learned likely says something about their motivation to learn more. But testing for specific potential hasn't worked out the way Heinlein expected. Instead, testing for g works, and other tests for potential haven't proven terribly helpful. For all these reasons and more, the idea that hiring was a science fell out of favor. Which mostly shows how fad driven corporate America is. Serious institutions like the military (AFQT) and Procter & Gamble still use IQ-type tests in hiring. Procter & Gamble provides a sample of its venerable Reasoning Test here. P&G paid a lot of money to validate that its Reasoning Test was correlated with on-the-job performance to get the EEOC off its back. In contrast, the federal government developed a superb test battery in the 1970s for federal civil service hiring, the outgoing Carter Administration junked it in January 1981 because of disparate impact in the Luevano case. The Carter Administration promised that Real Soon Now they would replace PACE with a test that was equally valid at hiring competent government bureaucrats, but upon which blacks and Hispanics didn't score worse. That was 32 years ago. Similarly, at the moderate-sized marketing research firm where I worked, initially they just gave Dr. Gerry Eskin's Advanced Quantitative Methods in Marketing Research 302 final exam from the U. of Iowa to each MBA who walked in the door looking for a job. It did a pretty good job at hiring good people. Eventually the company grew large enough that the EEOC noticed the hiring exam. Instead of ponying up the money to validate Eskin's exam, though, we just junked it and winged it after that, with less satisfactory results. It's not a coincidence that when I read up on the history of psychometrics in the U.S. in the mid-20th Century, an awful lot of breakthroughs took place at land grant colleges rather than at Harvard and Yale. People in places like Iowa City thought better objective testing was going to be better for people in Iowa. And they were largely right. Of course, we now know -- instinctively! -- that these midwestern methodologies were a giant conspiracy by the white male power structure. So today we fight the power by just hiring Harvard and Yale grads. But now it’s coming back, thanks to new technologies and methods of analysis that are cheaper, faster, and much-wider-ranging than what we had before. For better or worse, a new era of technocratic possibility has begun. Consider Knack, a tiny start-up based in Silicon Valley. Knack makes app-based video games, among them Dungeon Scrawl, a quest game requiring the player to navigate a maze and solve puzzles, and Wasabi Waiter, which involves delivering the right sushi to the right customer at an increasingly crowded happy hour. These games aren’t just for play: they’ve been designed by a team of neuroscientists, psychologists, and data scientists to suss out human potential. Play one of them for just 20 minutes, says Guy Halfteck, Knack’s founder, and you’ll generate several megabytes of data, exponentially more than what’s collected by the SAT or a personality test. A lot of what Silicon Valley does these days is wheel re-invention. Nobody remembers the past because so much effort has been invested in distorting memories to validate current power arrangements, so a lot of things that are sold as technological breakthroughs never before possible are really just ways to get around government regulations that were imposed because they seemed like a good idea at the time. For example, there are now a lot of Ride Sharing companies that you can hire via your smartphone to come pick you up and drive you somewhere. In other words, they are taxicab companies, but because they are High Tech and all that, they feel entitled to ignore all the expensive rules the government has piled on taxicab firms about how they have to take people in wheelchairs to South-Central. Here's a guess: much of what these Silicon Valley startups measure that's actually useful is good old IQ. And it will have the same disparate impact problems as everything else did. ... Because the algorithmic assessment of workers’ potential is so new, not much hard data yet exist demonstrating its effectiveness. Actually, the military has been measuring job performance versus test scores for 60 years. Much of the results are available online, typically in Rand Corp. documents. But, who is interested in that? That's what my marketing models professor at UCLA B-school said in 1982: on the hiring and insurance sides of the business, it's easy to come up with highly effective models of who you want and who you don't want if you are allowed to use race. But you aren't allowed to, so that's where the challenge is. Will eating nuts save your life? One of the more eye-catching ways to promote a food or a medicine is to calculate the total reduction in deaths among those consuming the wonder product. According to the largest study of its kind, people who ate a daily handful of nuts were 20 percent less likely to die from any cause over a 30-year period than those who didn’t consume nuts . . . Their report, published in the New England Journal of Medicine, contains further good news: The regular nut-eaters were found to be more slender than those who didn’t eat nuts, a finding that should alleviate fears that eating a lot of nuts will lead to overweight. . . .
For the new research, the scientists were able to tap databases from two well-known, ongoing observational studies that collect data on diet and other lifestyle factors and various health outcomes. The Nurses’ Health Study provided data on 76,464 women between 1980 and 2010, and the Health Professionals’ Follow-Up Study yielded data on 42,498 men from 1986 to 2010. . . .
Sophisticated data analysis methods were used to rule out other factors that might have accounted for the mortality benefits. For example, the researchers found that individuals who ate more nuts were leaner, less likely to smoke, and more likely to exercise, use multivitamin supplements, consume more fruits and vegetables, and drink more alcohol. However, analysis was able to isolate the association between nuts and mortality independently of these other factors. . . . The authors noted that this large study cannot definitively prove cause and effect; nonetheless, the findings are strongly consistent with “a wealth of existing observational and clinical trial data to support health benefits of nut consumption on many chronic diseases.” . . . The study was supported by National Institutes of Health and a research grant from the International Tree Nut Council Nutrition Research & Education Foundation. The press release did not link to the study—what’s with that, anyway, how hard would it be to include a link?? ?—but a quick google led to this article, “Association of nut consumption with total and cause-specific mortality,” by Ying Bao, Jiali Han, Frank Hu, Edward Giovannucci, Meir Stampfer, Walter Willett, and Charles Fuchs. Similarly, back in the mid-1990s, my doctor said my cholesterol was too high so I should take a statin. An affable detail man had just given him a box of free Mevacor pills. (Mevacor had been the first statin on the market when introduced in 1987.) So my doctor gave me a fistful and wrote a prescription. But I looked up statins on the new-fangled Internet and found that the hot new statin was Lipitor, which went on to become the biggest moneymaking pill in the world in the 2000s. The most striking Lipitor study was one from Scandinavia that showed that among middle-aged men over a 5-year-period, the test group who took Lipitor had a 30% lower overall death rate than the control group. Unlike the nuts study, this was an actual experiment. That seemed awfully convincing, but now it just seems too good to be true. A lot of those middle-aged deaths that didn't happen to the Lipitor takers didn't have much of anything to do with long-term blood chemistry, but were things like not driving your Saab into a fjord. How does Lipitor make you a safer driver? I sort of presumed at the time that if they had taken out the noisy random deaths, that would have made the Lipitor Effect even more noticeable. But, of course, that's naive. The good folks at Pfizer would have made sure that calculation was tried, so I'm guessing that it came out in the opposite direction of the one I had assumed: the more types of death included, the better Lipitor looks. Apparently, guys who took Lipitor everyday for five years were also good about not driving into fjords and not playing golf during lighting storms and not getting shot by the rare jealous Nordic husband or whatever. Perhaps it was easier to stay in the control group than in the test group? If this nuts-save-your-life finding is valid, then the greater effects should be found in causes of death near the top of the list (e.g., diabetes). But if it turns out that eating nuts only slightly reduces your chances of death from diabetes but makes you vastly less likely to be struck by lighting, then we’ve probably gotten a selection effect in which nut eaters are more careful people in general and thus don’t play golf during thunderstorms, or whatever. Harvard  is different. They had 758 kids majoring in economics, 495 in government, 306 in social studies, 290 in psychology, 247 in English, 236 in history, 158 in history and literature, 155 in neurobiology, 154 in molecular cell biology, 154 in sociology, and so forth. A few colleges have done well for themselves having elite business schools for undergrads, such as Wharton at the U. of Pennsylvania and, in recent years, Stern at NYU. In general, though, letting undergrads study something directly applicable to getting a white collar corporate job is considered de classe. Studying business -- at least before your late 20s in MBA school -- is downscale. Instead, economics has become the de facto business major at the Harvards of America. You're not dirtying your hands studying anything all that relevant to the vast majority of corporate jobs. Yet majoring in economics shows: Although I Am A Gentleman, I Am Also Interested in Money. So, it's the ideal major for the career path of Wall Street or consulting entry level analyst --> MBA School --> Big Money. Something striking is how little relevance a strong knowledge of economics has for most jobs. As an old Econ major, I noticed this in the mid-1980s when I was in charge of introducing personal computers into the large marketing research company where I worked. I hired a PC tech guy who turned out to be notably smarter than me in sheer problem solving ability. But, like the Scarecrow in the Wizard of Oz, he didn't have a diploma. He'd enlisted in Admiral Rickover's nuclear Navy out of high school and spent six years minding the reactors on nuclear subs. I quickly let him move up from fixing computers to playing a sizable role in tactics and strategy. That led to the one incident in which I noticed a major benefit from my having taken nine full semester courses in Econ. One day in 1987 my assistant proposed that we should stop buying PCs from Dell (or PC's Ltd. or whatever it was called way back then). Instead, we should buy the parts in bulk and hire workers to assemble them for us. I replied that PCs were a highly competitive business with no obvious barriers to entry, so it's precisely the fact that his plan wasn't ridiculous that meant that it most likely wasn't worth doing: competition would have driven the rate of return down to a level where we'd be indifferent between assembling PCs ourselves or having Dell assemble them for us. Management attention was our main limiting resource, so outsourcing to young Mr. Dell the obsessing over PC parts purchasing and assemblage was a task I was happy to pay him a small premium to do. My colleague did not believe me, so I encouraged him to make up a spreadsheet and see for himself whether he could beat Dell's price by much. A couple of hours later he came back and said I was right: if we did everything perfectly, we'd only save $10 or $15 per PC, and we wouldn't do everything perfectly. So why bother? Fortunately for the dynamism of American business, most econ majors never take the quietist lessons of econ theory to heart. While U. of Chicago economics professors are said to never bother to pick up $20 bills off the sidewalk because surely the efficient market would have done it already, most Harvard econ majors are blithely immune to econ's basic model of perfect competition reducing profits to the risk-adjusted interest rate. 1. What are the effects on the student of the upscale study path of econ -> business v. the downscale path of business -> econ? 2. What are the effects on America of a social structure in which econ majors make up a sizable fraction of the rich and connected? I've never seen any academic studies of either question. Off the top of my head, it would seem like it would make more sense when you are younger to study narrower topics of business; then, if you wish, come back to academia once you have some real world experience and study the broader topics of economics. I was an unusual student in that I went directly from undergraduate to MBA school in 1980. Something I noticed was that at age 21-23 I enjoyed the MBA school topics more than the undergrad topics because they felt more age-appropriate. As an undergrad econ major, I was supposed to worry about things like: What should the Fed do now? I had lots of opinions on the Fed, but I never felt like the Fed was on the verge of calling me up and asking me for advice, much less paying me money to tell them what to do. In B-School, however, we talked about case studies like: should a pet foods company bring out a line of gourmet refrigerated dog foods for the luxury market? * That seemed like the kind of topic that a company might plausibly pay me money in the next few years to advise them upon. As for the current dominance of econ majors in our national lives, it wasn't always like this. As an econ major in the 1970s, there was a sense that we band of brothers, we happy few were taking on the palpable ignorance that had led to idiocies like the President declaring a national wage and price freeze on August 15, 1971. The good news is that a country run by econ majors isn't likely to do that again. The bad news is that certain fetishes of econ majors, such as an unthinking advocacy of free trade or open borders, become totemic status markers of having majored in Big Money Econ. Americans respect people with lots of money and so they respect econ majors, so they tend to be unskeptical about ideas that econ majors absorbed during their impressionable late teenage years. Hence the elite credulity about open borders is understandable: dismissing immigration restrictionists as ignoramuses who obviously haven't majored in econ does correlate at some level with making a lot of money on Wall Street. But it's a helluva way to run a country. * In case you are wondering about gourmet refrigerated dog foods, a little poking around on the Internet shows they they were not successful back in my day, but have over the last few years become an established category. I suspect a necessary condition was the development of stand-alone pet food stores and/or small, cheap refrigerators that are now ubiquitous in retail outlets, typically for soda pop. The big problem I noticed in 1981 with the idea (besides the obvious questions about whether it's stupid and does your dog really care?) was that supermarkets would be reluctant to stock dog food in with refrigerated human food, while pet food aisles in supermarkets didn't have refrigerators. A commenter suggests that Knockout Game is actually just youths celebrating their holiday of Fistivus. After all, why should the articulate be privileged when it comes to the Airing of Grievances ("I got a lot of problems with you people!")? Fistivus simply merges the Airing of Grievances with the Feats of Strength. Perhaps The Hunger Games works best as an allegorical critique of poor dumb Red State provincials volunteering to serve in the Capitol’s wars without even getting a cut of the Beltway’s black-budget contracts. pre-Socratic: The knockout game is impossible because a fist would have to traverse an infinite number of infinitesimally small spaces just to reach a head. Socratic: Those who admit they know nothing about the knockout game are wiser than those who think they do. Aristotelian: No man can be called happy until he has died never having suffered the knockout game. Descartes: All I can know for certain is that I am thinking of the knockout game. Leibniz: If the knockout game were real, this would not be the best of all possible worlds. Kant: It is never permissible to lie, even if it is to misdirect knockout game players from their intended victim. Hegel: The knockout game is the necessary antithesis to the Trayvon Martin shooting's thesis. Their synthesis will advance the World Spirit. Nietzsche: All higher culture is based on the knockout game. William James: The point is not whether the knockout game is good or bad, but is it useful? Heidegger: To be a victim of the knockout game is to experience true dasein by being thrown into the world and having one's crushed, bleeding temple be finally ready-at-hand instead of just present-at-hand. I posted this a month ago, but it's worth bringing up again with the current interest in crime. Violent and property crime rates rose for U.S. residents in 2012, the Bureau of Justice Statistics (BJS) announced today. These estimates are based on data from the annual National Crime Victimization Survey (NCVS) which has collected information from victims of crime age 12 or older since 1973. It's not a huge change, but it's unsettling after we were getting used to the good news on crime during the first couple of years of the recession. You can read my discussion of the numbers here. One of the reasons the story gained so much traction could have stemmed from the fact that Milwaukee is the most segregated city in the country, and it validated white residents' fear that their black neighbors are dangerous. True story. A couple of years back, I was walking home at night on North Capitol Street here in Washington, D.C., when two dudes randomly assaulted me before running away without stealing anything. At the time, I didn't think it was all that strange—I've lived in urban areas all my life, and plenty of people I know have been victims of anonymous street crime. The good news is that urban crime rates have been trending downward since I've been about 9 years old, so we're making important progress in this regard. The weird thing was that after I blogged briefly about this, a number of conservative bloggers, particularly those of a racist bent [me, of course], decided that this wasn't just one of many random acts of criminality that occur in the big city. No! It was an instance of "Knockout King," which I suppose was the 2011 version of 2013's more robust Knockout Game white racial panic. People shouldn't minimize these concerns about urban violence, but it accomplishes nothing in terms of tackling them to concoct weird trends and games out of thin air. I'm struck by how our society wants victims of black-on-white violence to play the macho tough guy in public, as Yglesias tries to do here, or as journalist Brian Beutler (who was shot during a robbery while walking with a journalist named Matthew) does here. Being a crime victim is, among other things, being psychologically assaulted. Our culture has made much progress in better psychological treatment of women who are raped -- e.g., providing female cops to do the interviewing of the victim, counseling, support groups, and so forth. It helps crime victims to have your culture acknowledge the terrible thing done to you, and that it wasn't your fault. But this balm is selectively dispensed upon our culture's usual Who? Whom? lines. For youngish white male victims of black violence, the media's message is: Don't be a wimp. Walk it off, dude. Don't go crying about how it makes you feel. It's not part of a larger pattern, it's just something that happened to you personally. Nobody else cares about what happened to you because it's not a Thing we are supposed to talk about on TV, it's just your problem. Remember, what does not kill you makes you stronger, so, shut up and deal with it. As part of my research, I have come up with ten building blocks needed for reasoned analysis of migration. Some are straightforward; others are analytically tricky and you will need to chew on them. Indeed – with apologies for a self-serving remark – you will need to read the book. Block 1 Around 40 per cent of the population of poor countries say that they would emigrate if they could. There is evidence that suggests this figure is not a wild exaggeration of how people would behave. If migration happened on anything approaching this scale, the host societies would suffer substantial reductions in living standards. Hence, in attractive countries, immigration controls are essential. Block 2 Diasporas accelerate migration. ... These links cut the costs of migration and so fuel it. As a result, while diasporas are growing, migration is accelerating. Block 3 Most immigrants prefer to retain their own culture and hence to cluster together. This reduces the speed at which diasporas are absorbed into the general population. The slower the rate at which they are absorbed, the lower the rate of immigration that is compatible with stable diasporas and migration. By design, absorption is slower with multicultural policies than with assimilative policies. Block 4 Migration from poor countries to rich ones is driven by the wide gap in income between them. ... Migrants are escaping the consequences of their systems but usually bring their culture with them. Block 6 Because migration is costly, migrants are not among the poorest people in their home countries. The effect on those left behind depends ultimately on whether emigrants speed political and social change back home or slow it down. A modest rate of emigration, as experienced by China and India, helps, especially if many migrants return home. However, an exodus of the young and skilled – as suffered by Haiti, for example – causes a haemorrhage that traps the society in poverty. Block 7 In high-income societies, the effect of immigration on the average incomes of the indigenous population is trivial. But, what about the costs of the indigenous population? What everybody is interested in is not incomes or costs, but their net: standard of living. Block 8 The social effects of immigration outweigh the economic, so they should be the main criteria for policy. These effects come from diversity. Diversity increases variety and this widening of choices and horizons is a social gain. Block 9 The control of immigration is a human right. The group instinct to defend territory is common throughout the animal kingdom; it is likely to be even more fundamental than the individual right to property. ... It sometimes makes sense to grant the right to migrate on a reciprocal basis. Thousands of French people want to live in Britain, while thousands of Britons want to live in France. Block 10 Migration is not an inevitable consequence of globalisation. The vast expansion in trade and capital flows among developed countries has coincided with a decline in migration between them. These ten building blocks are not incontrovertible truths but the weight of evidence favours them to varying degrees. If your views on migration are incompatible with them, they rest on a base too fragile for passionate conviction. Read the whole thing there. So far, after three days up, this long, important article has a grand total of 15 comments. Charlotte Allen has another well-reported cover story in The Weekly Standard, following earlier ones on the SPLC and the White Privilege Conference. This one is "Silicon Chasm: The class divide on America's cutting edge." The middle class is doing well in Silicon Valley, if you define the middle class to be people like my old Rice U. roommate Fritz, an engineer and former U.S. Navy officer who is head of quality control for a Silicon Valley firm that makes pacemakers and other more advanced life-and-death medical devices. Back in the 1990s, he and his wife tired of their 900 square foot house in the Valley, so they moved their family to Half Moon Bay on the foggy Pacific. Fritz does the long commute over the Santa Cruz Mountains. It's a fine middle class life, if you assume that the middle class starts at about Rice STEM grads and goes up from there.